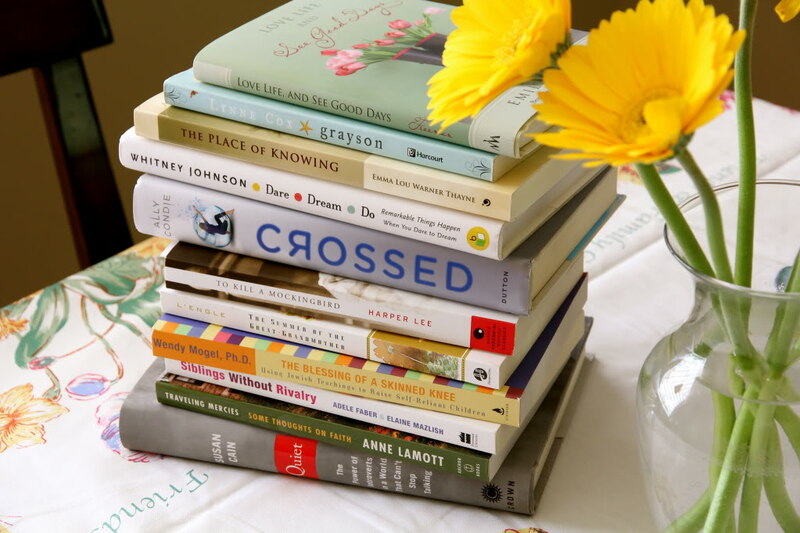 Since the photo on my “Books” page still shows a poinsettia from Christmas, I figure it’s high-time we discuss some good reads, share what’s on the nightstand for the summer. Love Life and See Good Days by Emily Freeman – This positive little book is rich with encouraging thoughts that help you see life differently. It will make you laugh, change your perspective, help you focus on the kind of understanding that comes from God. My friend Emilie dropped it by one Sunday afternoon. Her smile lit up our porch and filled our living room. She (it) was just what I needed. Grayson by Lynne Cox – I loved this book. It’s the perfect summer/beach read. It tells the true story of a miraculous encounter between a teenage girl and a baby whale off the coast of California. Lynne Cox has set records all over the world for open-water swimming. One morning while swimming the last half mile of her workout, Lynne became aware that a baby gray whale was following alongside her. Knowing if the whale followed her to the pier its lungs would collapse, Lynne determined to keep swimming in search of the baby’s mother. I won’t tell you what happens, but I will tell you I’m pretty sure I held my breath the ENTIRE book. And didn’t exhale until the last page. Her writing is mesmerizing, gripping, and offers a mysterious, magical glimpse into the natural world of the sea. Four stars! The Place of Knowing by Emma Lou Warner Thayne – This is the spiritual autobiography of one of Utah’s most revered and loved Mormon poets. It is an eloquent memoir, full of essays and poetry, in which Emma Lou tells of her near-death experience. Without warning, an iron rod smashed through a car windshield into her face. Emma Lou narrates her long recovery, and as always, is insightful and full of wisdom. Her words and stories will fill any spiritual seeker, no matter their background or religion. While reading, I realized I have so very much to discover. According to Emma Lou, knowing is a process, not an arrival. Dare, Dream, Do by Whitney Johnson – Whitney, my friend, if you’re reading this, I must tell you, you blew me away. Your book is remarkable, energizing, inspiring. When I met Whitney two years ago, this book was a dream in the works. To hold it in my hands and consider what it took for her to make this dream come true was a lesson of its own. Whitney, mother of two, popular Harvard Business Review blogger, and successful Wall Street analyst, had a goal: to help women identify and achieve their dreams. While living in New York City, she began asking women about their dreams. To her surprise, some women didn’t have a dream. In fact, they weren’t even sure it was alright for them to dream. Whitney gently and wisely helps women identify a dream that is right for their time and space in life. She helps readers recognize what would be required to realize that dream – the costs, the benefits. And she encourages all kinds of dreams. The dream of being a mother, a photographer, a humanitarian, a writer, a teacher. She recognizes that our dreams are as varied as we are. Whitney’s book is full of amazing personal stories that help us consider the great good we can put in motion if we simply dare to dream. Crossed by Ally Condie – Last summer I read Ally’s first book, Matched. Loved it. Better than Hunger Games. It was good YA fiction to get lost in. But I’m an Ally Condie fan. I like her writing. Her second book moved slower for me and I was a bit confused at the onset, since each chapter alternates between Ky and Cassia as voice. But my brain finally got the hang of it and I enjoyed it. You can guarantee, I’ll be reading her third book, Reached, when it comes out in November 2012. The lower half of the stack are books I am currently reading or hoping to read by the end of summer. I know, a lofty goal. To Kill a Mockingbird by Harper Lee – How in the world did I get through High School and College (including an English minor) without reading this book?? I’ve been hearing about Boo Radley and Atticus Finch for so many years; I know the story. But when I saw it a Costco last month I thought, Honestly. I have GOT to read that book! I’m four chapters in and looking forward to every page. The Summer of the Great-Grandmother by Madeleine L’Engle – The Crosswick journals are becoming a favorite of mine. It’s a shame I didn’t discover them sooner. This one is the second in L’Engle’s series (which I have been reading out of order!). I adore her writing. It transcends life as we usually know it. She speaks a language I understand, makes me want to live deeper, better. The Blessing of a Skinned Knee by Wendy Mogel – This practical parenting guide is all about raising self-reliant children. Mogel is a clinical psychologist who also wrote The Blessing of a B Minus. With warmth, humor, and her knowledge of the Jewish Torah, Mogel teaches how we can raise compassionate, ethical and self-reliant children in a world where entitlement and competition abound. Siblings Without Rivalry by Faber & Mazlish – This book has given me so many excellent tools, phrases, and coping strategies for mediating conflict in our family. I’m half way-through and underlining as I go, so I can review easily (probably on a yearly basis). The concepts taught require real practice. But they have been helping. Next up? Their book, How to talk so Kids Will Listen and Listen so Kids Will Talk. Brilliant title, eh? Traveling Merciesby Anne Lamott – I love Anne Lamott. In spite of (or maybe because of) her irreverence. She is witty but wise, and she knows how to talk about life in an accessible way. I loved her book on writing – Bird by Bird. So how could I not love her thoughts on faith? Just started this one so I’ll let you know what I find. Quiet by Susan Cain – Subtitle? The Power of Introverts in a World that Can’t Stop Talking. Intriguing, no? I’ve just started this book, but I’m already fascinated. Whether you are an introvert, live with one, work with one, share family dinners with one, you need to read this book. Quiet shows how dramatically we undervalue introverts. Cain draws on cutting-edge research in psychology and neuroscience to reveal the surprising differences between extroverts and introverts. It’s extremely eye-opening. Michelle recommended it months ago and recently wrote this raving post about it. And there sits the stack. What’s in your stack? Oh, and for your early readers? We’ve been loving the BOB books. I tell you this because I wish someone had turned me onto these when Eliza was beginning to read. So would this be a bad time to tell you that I just finished the Fifty Shades of Grey trilogy? (Don't tell my mother) shhhh…. To Kill a Mockingbird is such a wonderful book — good for you that you finally get to read it. But really, how _did_ you get through school without reading it, ;-)? I can't wait to read Quiet. It's on my to-read list. I'm also in the middle of reading Ree Drummond's "confessions of a prairie woman" – love her blog and the book's equally a hoot. We've been using the Bob books, too. Did you buy the complete set? Is that possible? I was looking at these just the other day and it seemed like you have to buy each set individually. ?? Corinna – the missing of the mocking bird… i know – it's a mystery! Knit 1, Knit 2 – Would love to hear what you think of Quiet when you finish. And I agree, Pioneer Woman is a hoot. Good to know you've liked her book. Cristie – I'm sure you could impart some good recommendations yourself, lovely lady! Elizabeth – yes, even on Amazon I've only been able to buy the BOB books as individual sets/boxes. I have also seen them at Costco on occasion for a good price. What are you reading?